Live2Support's iPhone, iPod touch and iPad mobile app now makes it possible for a single chat operator to handle multiple chat requests concurrently while rendering live chat service over an iPhone. Chat operators can toggle between more than one operator chat window and engage in live chat with online customers without having to invoke a chat queue thereby significantly enhancing the user experience in the mobile space. Once you logged in at Live2support! Live Chat Software through your iPhone mobile application, a real-time list of all visitors of your website will display with their current status & you will be able to proactively invite visitors. You can also view the duration that they have spent on your site, number of previous visits, which URL they clicked to arrive on the website, from which part of the world they have landed on the website and many more. Is a Web based application for showing news headlines, RSS source, items list. Application as Service - system utility to run applications as Windows services. OlapX is a multidim. database browsing tool and cube creation. Add live chat on your web site watch visitors in real time and chat with them. Launches any program for inserted CD - just associate program(s) to launch. Monitor your visitors, chat with them live! Intranet is a simple office management tool for the management to supervise. 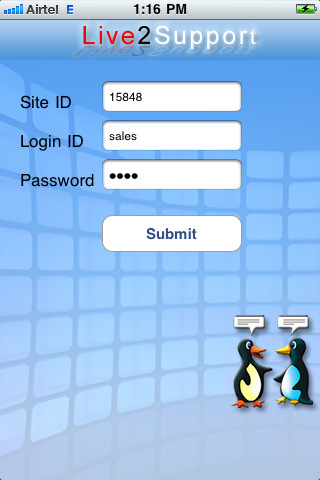 Instantly Generate Fast, Secure ASP/PHP Web Database Apps without programming! Qweas is providing links to Live2Support Chat Application for iPhone iPod and iPad 1.1 as a courtesy, and makes no representations regarding Live2Support Chat Application for iPhone iPod and iPad or any other applications or any information related thereto. Any questions, complaints or claims regarding this application Live2Support Chat Application for iPhone iPod and iPad 1.1 must be directed to the appropriate software vendor. You may click the publisher link of Live2Support Chat Application for iPhone iPod and iPad on the top of this page to get more details about the vendor.